Yeah, that title is straight out of a Disney movie title song. I swear. Google it! 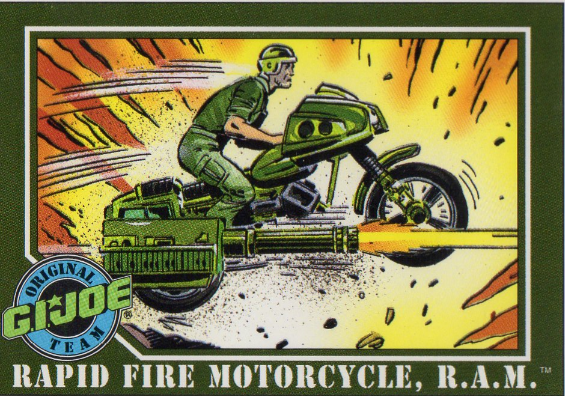 It is kind of appropriate for the #61 Impel Trading Card we will take a look at today. Ladies and Gentlemen, meet Wet-Suit. Although I was born and raised in a small seaside town, I’m not a huge fan of swimming and diving. 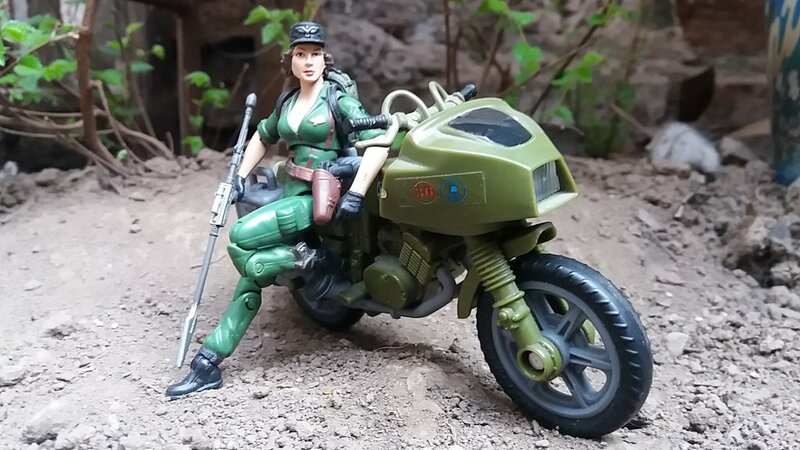 So aquatic themed Joes/Cobras and their vehicles don’t rock my boat (pardon the pun). 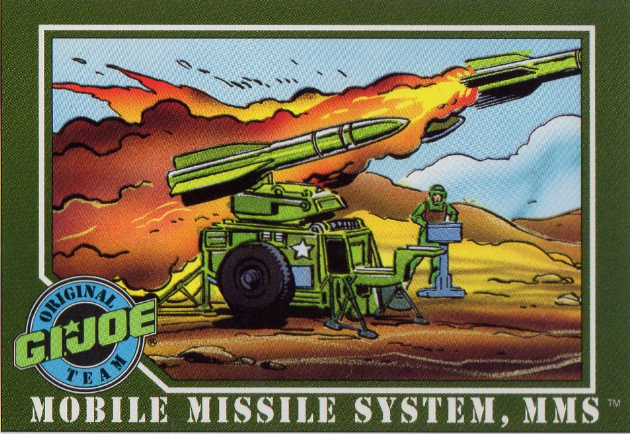 The only exceptions are probably the Cobra BUGG and Hammerhead. How cool are those? Totally non-functional, but boy do they look good. 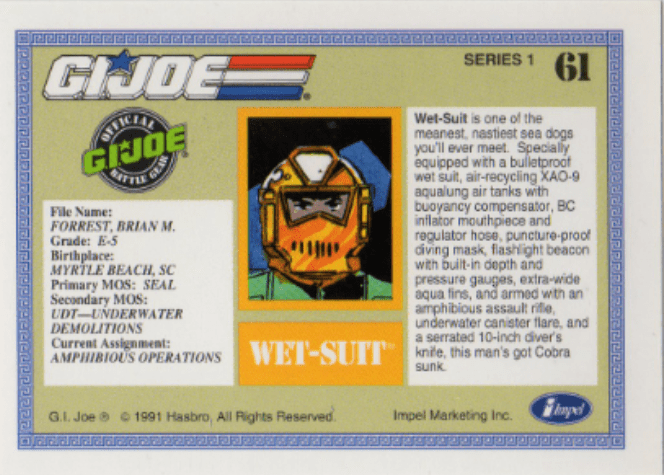 Back to today’s Joe though, Wet-Suit is a Navy Seal. Best of the best, toughest of the toughest. Obviously, this guy would be a member of the G.I. Joe team. One of my all-time favorite stories is the one told in Special Missions #1. Wet-Suit is part of the team that is sent undercover into the Baltic Sea to extract a Russian defector. The story really pulls you in and the twist at the end is just sublime. 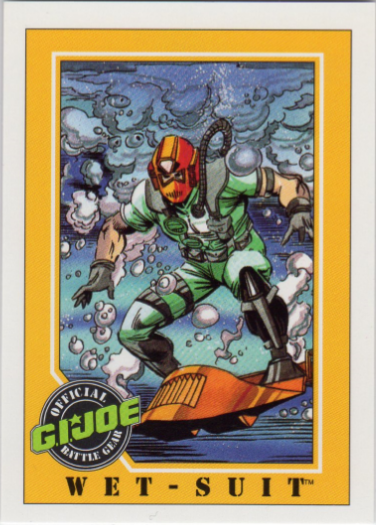 In the cartoons, the most remarkable feature of Wet-Suit is his constant rivalry with Leatherneck, portraying that of Navy vs Marines. I do believe that Wet-Suit entered an Ultimate Fighter kinda tournament, but it was a Cobra scheme. Details are a little foggy, I need to rewatch the Sunbow series again pretty soon. As far as the figures go, I only have the v4 from 1993 out of the 12 figures made. The bright orange and black design does look quite good. As for the other figures, well, like I said, the nautical thing doesn’t really do it for me, so I’m not actively looking to add more divers to my Joe collection, but that doesn’t mean, I’ll let them sink 🙂 Maybe when I get my very own USS Flagg, I’ll add more water Joes to my collection. That’s right, it says ‘when’, not ‘if’. Positive thinking people! Now, as promised, Miss Lara Croft sporting a wetsuit. I get up, and nothing gets me down You got it tough. I’ve seen the toughest around And I know, baby, just how you feel You’ve got to roll with the punches to get to what’s real. Welcome back! I’ve been recovering from a back injury and haven’t had the time nor longing to write some. But I’m getting better now and so here we are again with a new post. 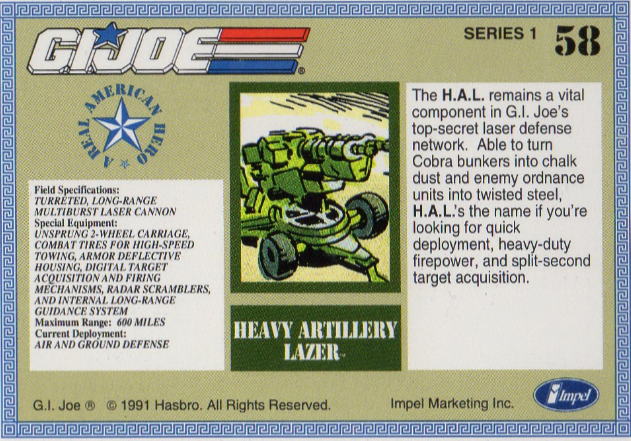 In the last 2 posts, we tackled the Original Joe team and the 2 Cobra infantry soldiers. 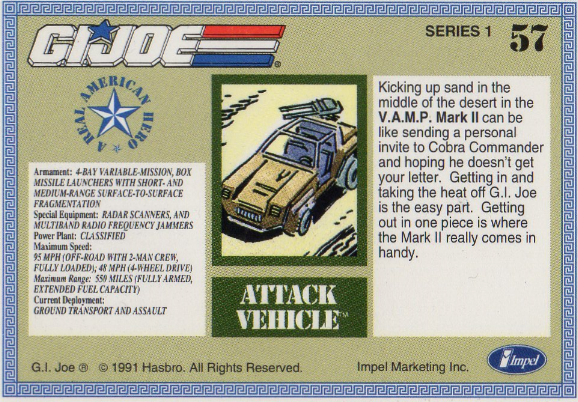 This time around we take a look at the 1982 vehicles, displayed on the Impel Trading Cards #54 through #60. As with most of the original figures, I don’t have a lot of these in my collection. Let’s jump right into it, with #54 the J.U.M.P. Jet-pack. The J.U.M.P. 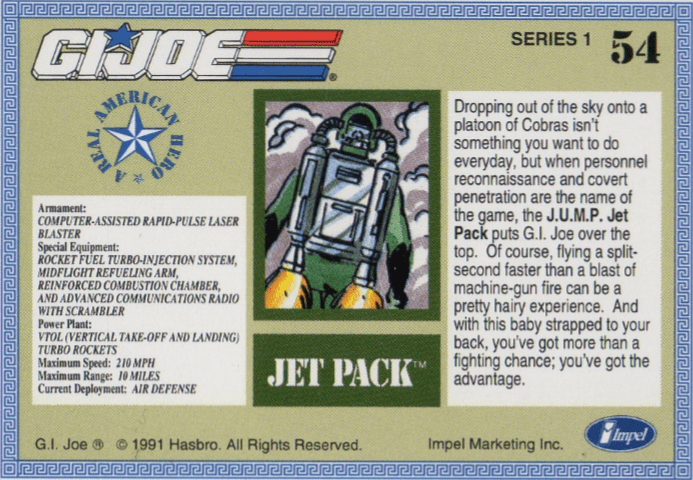 Jet-pack, giving your Joes wings since 1982. And probably some very serious burns and loss of legs… I definitely can see the charm of being able to fly to do recon or even attack the enemy. But this just isn’t practical. Not alone the safety issues (these people are professional soldiers, they can handle the heat), but the maximum range is only 10 miles and with a top speed of 210 MPH, this means about 3 minutes of flight time… (I know I’m ignoring acceleration, elevation and well, physics really, but it’s G.I.Joe, they’re above all that). 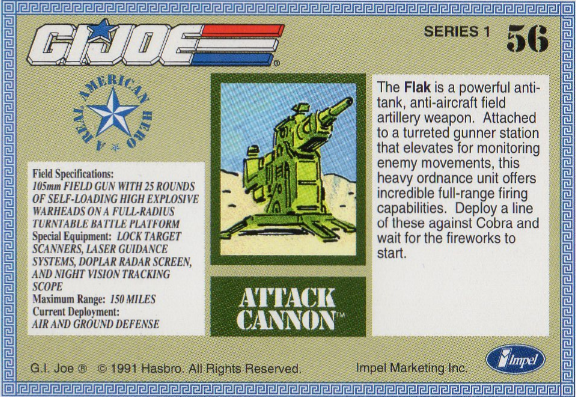 The toy was released in 1982 without a figure – smart marketing if you ask me. 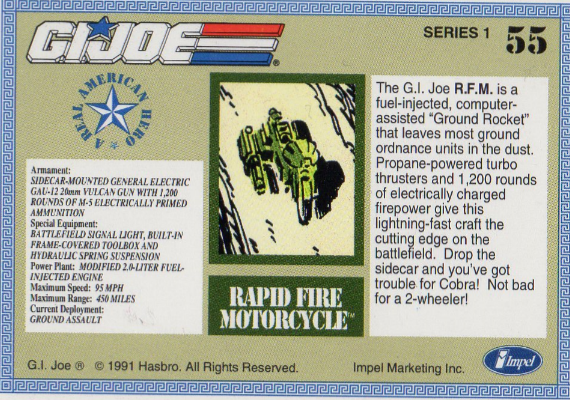 That way you should buy multiple Jet-packs for all your Joes 🙂 The next year, Grand-Slam was included in the package. He was depicted with the J.U.M.P. 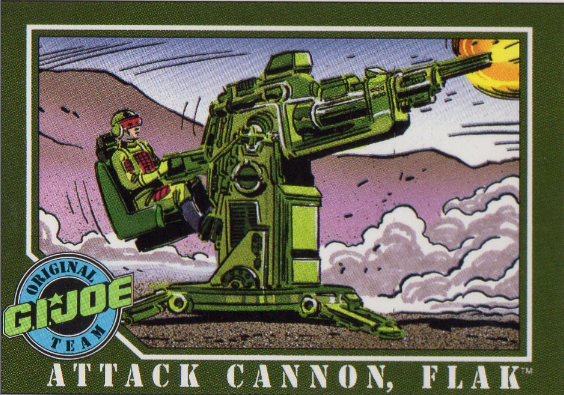 Jet-pack on card #50. The J.U.M.P. 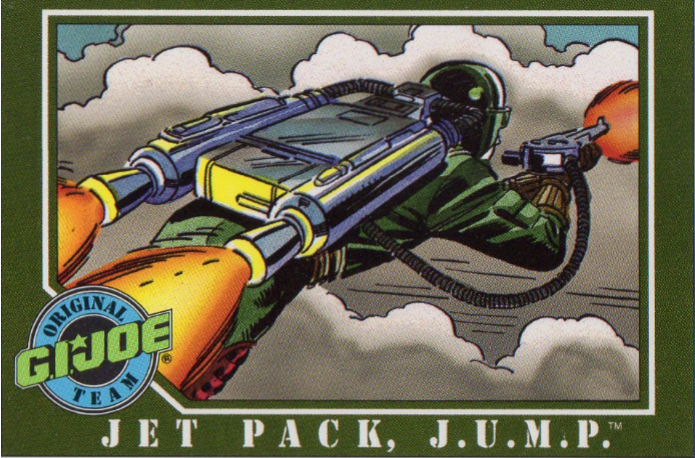 Jet-pack was used in the cartoons and the movie. Just wanted to mention this to link to the intro on Youtube again… Gotta love that intro. 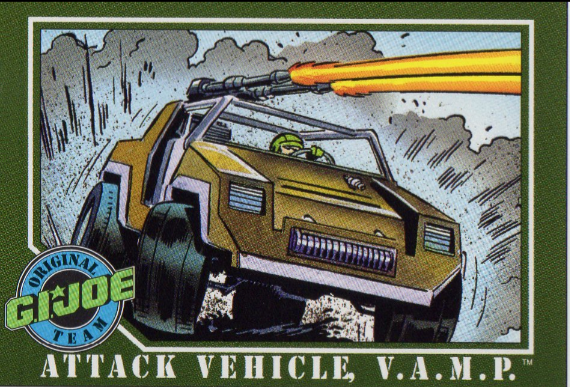 The final vehicle for today is without a doubt the most impressive one of the lot, the M.O.B.A.T. The M.O.B.A.T. 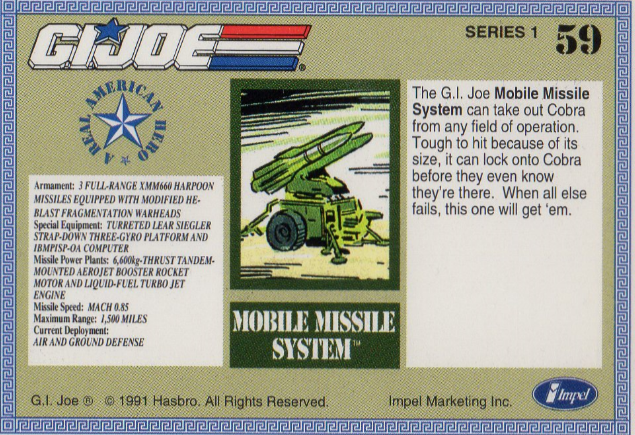 is about as real as you can get to an actual military vehicle. On top of that, the toy actually moved on its own. This tank is a BEAST. 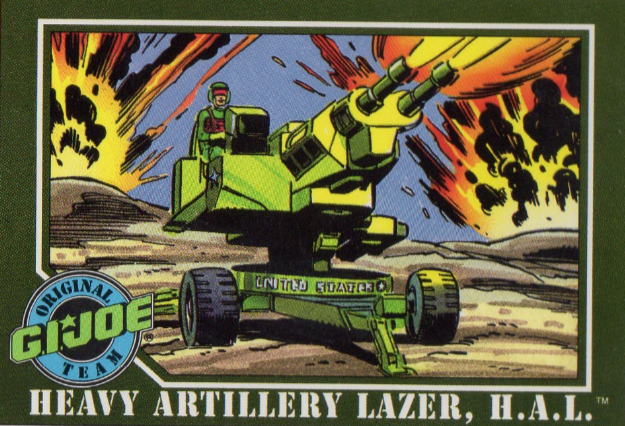 With a 130mm anti-armor cannon as the primary weapon, secondary weapon is the .50 caliber machine gun with 1,500 rounds of ammunition. 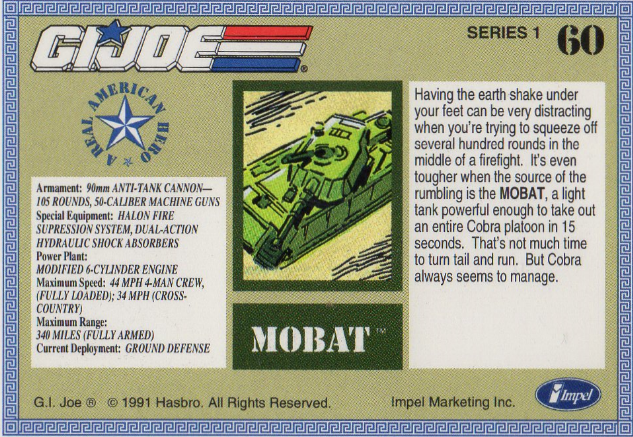 The MOBAT is powered by two gas turbine engines (the toy by batteries :-)) and can reach 60mph on an open road and 45mph driving cross-country. It can submerge in water for up to an hour due to retractable snorkels and air-tight hatches. I really like the M.O.B.A.T. 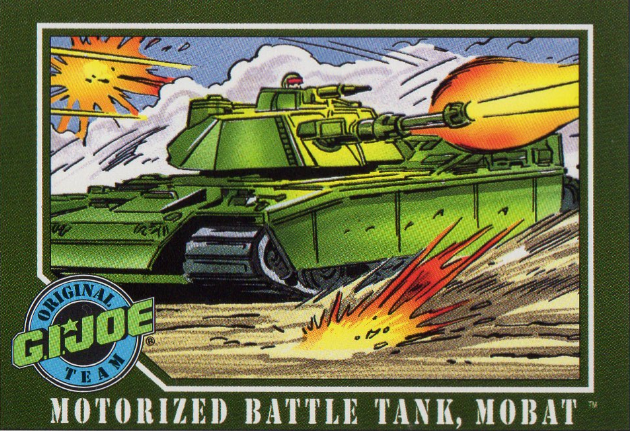 Unfortunately, it’s hard to find over here, but I was lucky to score an Action Force Battle Tank, which is basically the same vehicle, but with a different color scheme. Seriously, just look at how cool this thing is, even in a pretty old commercial, still looks better than 90% of the toy commercials they’re airing now. Well, that’s all for now. Next time, we’ll go where the people aren’t (according to Ariel that is).